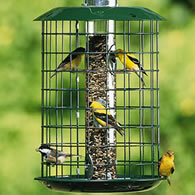 A Thistle Feeder is the way to go if you want to attract more Goldfinches, (little yellow bird) Purple Finches, House Finch, and Pine Siskins to your yard for more bird watching fun. 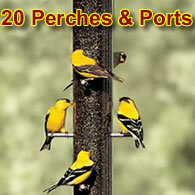 You'll find a wide variety of quality products on this page, sure to suit yours and the birds desires. 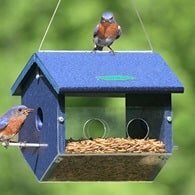 Fill these with nyjer seed, (a tiny black seed available anywhere bird seed is sold) and you'll be rewarded with more birds at your feeders this winter. Check out the selection we have waiting for you and your hungry birds. 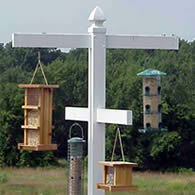 Providing a variety of seed types at your bird feeding station, is the surest way of attracting more birds. 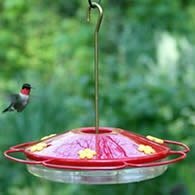 You can achieve this by offering nyjer seed in one of the above Tube Type Finch Thistle Feeders, and by adding sunflower seed in one of our Squirrel Proof Types. One good reason for providing nyjer seed is that squirrels and larger birds like Grackles do not have any interest in this type of seed. This seed type does not sprout as it has been sterilized before entering the U.S. For the most part, this seed is imported from India. Often mistakenly called thistle seed. Although a tiny seed it still has a shell and these shells will pile up on the ground below the feeders. Care should be taken to keep the area clean as it can attract rodents. Most all seeds need to be cleaned up for this reason. Sometimes it seems the chickadees and Finches just seem to not be able to get enough of this seed and other times they don't seem to go near it. I can't explain the reason for this behavior assuming the seed is fresh and the feeders are clean. Maybe the birds are like us and just choose to eat something different. It is important to not let the nyjer seed go bad and get moldy. This can cause harm to the birds. Heat and moisture can cause it to go bad. 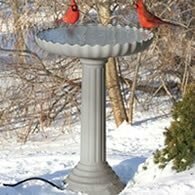 If it does get moldy throw it away in the trash and wash the feeders well. Refill with fresh seed. 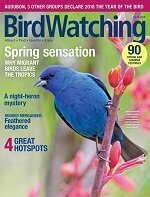 Thank you for taking a look and for caring about our birds.